Visit us at our factory in Cronenberg. We will be happy to set up an appointment. Directions to our plant follow. At the junction “Sonnborner Kreuz” take the 2nd exit “Remscheid” (do not follow signs on “W.-Cronenberg”). Continue in direction of “Remscheid”, make two right turns, one left turn, and one right turn. Please continue with “L74 towards Remscheid”. At the junction “Sonnborner Kreuz” take the “Remscheid” exit. 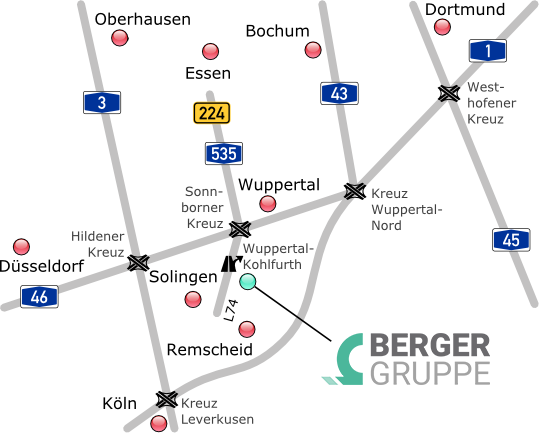 Now you are driving on the L74 highway in the direction of “Remscheid”. After approx. 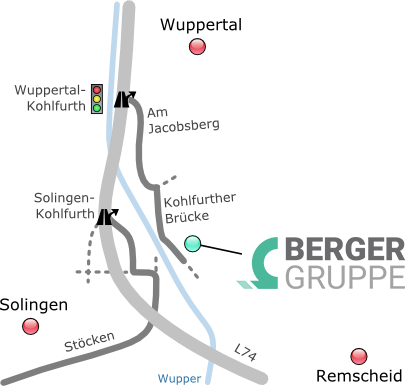 5 km (3 mi), take the “Wuppertal-Kohlfurth” exit and turn left at the traffic light. You are in Wuppertal-Cronenberg, urban district Kohlfurth. Continue along the road “Am Jacobsberg” then turn right at the first street, “Kohlfurther Brücke” (brown sign “Straßenbahnmuseum”). Berger is located about 500 m (less than ½ mile) ahead on the left side of the street. You are in the center of Solingen. At the “Schlagbaum” intersection, turn onto “Kuller Str.” (L67) in the direction of Cronenberg. Continue in the direction of Cronenberg and veer left after approx. 600 m (less than ½ mile) onto “Cronenberger Str.” (L427). Continue for another 800 m (½ mile), then turn left on “Stöcken”. Continue for approx. 1300 m (¾ mile) and turn left onto “Kohlfurther Str.”. Turn right on the L74 highway in the direction of A46 / Essen / Wuppertal / W-Kohlfurth and then exit at the first light to the right.